The Official UFC Mouthguard provides great protection for your teeth and gums. Suitable for all combat sports including boxing and MMA. What is the UFC OPRO Gold Mouthguard? 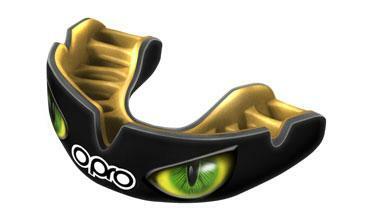 The OPRO Gold Level mouthguard is the competition level gum shield in the OPRO range. It is available in a range of colours and designs. This UFC gum shield is an official licenced mouth guard and offers dual layer protection ensuring the wearers teeth and gums are protected. What’s more, it also comes with antimicrobial additive in both the mouth guard and case. This helps to stop the build-up of up to 99.99% of bacteria. It is suitable for all combat sports, and can also be used for use when taking part of back ball and stick sports too. The mouthguard itself also has anti-microbial protection as standard in all Gold levels. Fitting any OPRO mouthguard is easy and safe to do. You can either follow the instructions included in each pack, or follow our easy to follow fitting video. It only takes a few minutes, and what you’re left with is a mouth guard that fits better than any other brand. What makes OPRO so much better than other brands? We have over 20 years’ experience in making mouthguards. In this time, we have understood what people want and how to make a good fitting mouthguard that not only looks great, but also fits properly and protects. The fins in each OPRO mouthguard are made of a high flow gel that softens during the fitting process. This is so that when you bite into it, they mould perfectly to your teeth. They also have special stretch zones that allow it to adapt to the contours of your mouth. Ordering your OPRO UFC Mouthguard online from us is simple, easy and secure. Order before 3pm on any working day to take advantage of our next day delivery! So what are you waiting for?